The beef in this slow-roast recipe simply melts in the mouth and is full of flavour. It's ideal for a long lazy lunch with family or friends. Preheat the oven to 160°C, gas mark 3. Heat half the oil in a flameproof casserole dish and brown the topside quickly in the hot oil, turning regularly. Remove from the dish. Heat the remaining oil in the casserole dish and lightly sauté the onions and garlic for 4-5 minutes until softened. Add the tomato purée and cook for a further 1-2 minutes. Add 500ml cold water and all the remaining ingredients except the cornflour and bring to the boil. 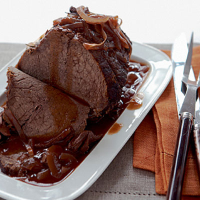 Return the beef to the pan, cover and place in the oven for 3-3½ hours. When ready to serve, remove the beef from the pan and place onto a serving dish. Cover with kitchen foil and keep warm. Mix the cornflour to a paste with a little cold water and stir into the red wine sauce. Bring to the boil and cook for 1 minute on the hob until thickened. Season, and serve the sauce spooned over slices of the beef, with creamy polenta and green beans. Polenta is quick and easy to prepare and makes a great alternative to potatoes. Simply cook in water or add stock for more flavour.